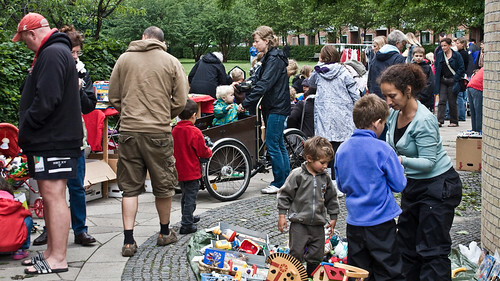 Did a post last year about how cargo bikes are a big part of flea markets. 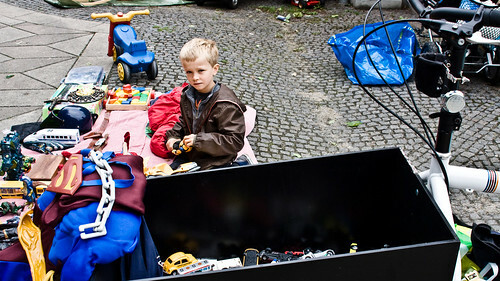 We had a space at this year's kids flea market and the best way to get the stuff there was by using our Bullitt. And once there, the bike is a part of the stand. We hung stuff on it and we filled up the cargo bay with a billion toy cars. I like the irony of using a bike to sell cars. They were 1 kroner each or all of them for 50 kroner [€7.00]. Fortunately, a lady bought the lot so we didn't have to drag them home again. Felix had a great day. 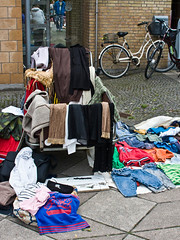 It was all his stuff he was selling and he made 400 kroner, so he was well chuffed. Many people use their bikes just to walk around, like this woman at the market. 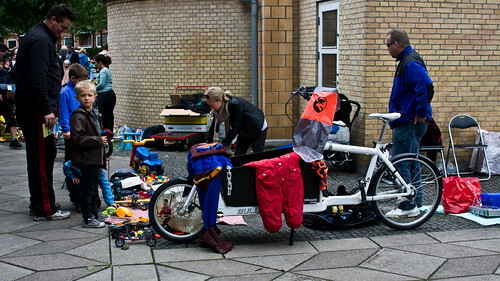 And we weren't the only ones using the bike as a rack AND transport.